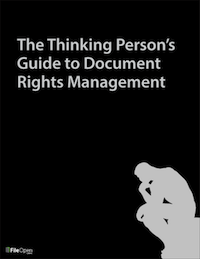 We’re excited to announce the release of our e-book, The Thinking Person’s Guide to Document Rights Management. We’ve packed 20 years of expertise and industry perspective into this accessible 15-page PDF, to help guide you as you consider using DRM for your business. You won’t find plugs for our products here—this guide is intended for anyone who wants to understand the key issues and considerations involved when choosing and implementing a DRM solution. We also review the latest in access control features available to publishers, such as device-specific permissions and watermarking that overlays user-identifying data. 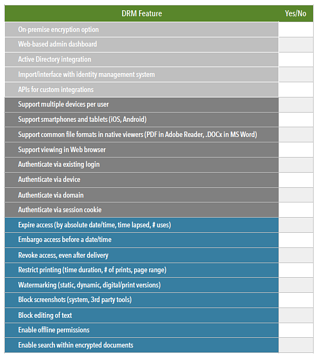 Then we pack it all into a handy DRM Feature Checklist you can use to compare DRM offerings. Not yet sure how you want to use DRM, or whether you want to at all? At the end of the guide you’ll find a list of Questions to Ask Your Team, which will help you clarify your business goals for document security and narrow your list of requirements for a DRM solution. In our experience, the most successful DRM rollouts are the ones that begin with thoughtful consideration of the long-term goals and user impact involved. We hope The Thinking Person’s Guide will save you time and money by helping to make sense of the wide and rapidly evolving world of document security. This free ebook will give you the inside scoop on the state of DRM technology and specific things to look for in a document security solution.